BCT Aspire are supporting fantastic Billingham lad Cole Lancaster and his family. Cole from Billingham suffers with four limb Cerebral Palsy. 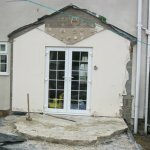 After a hard year of fund raising BCT Aspire are personally building an extension for the family on their home. Following on from Paul’s “Burg’s Big Walk Home 2010″ where he walked from Portsmouth to his and Coles home town of Billingham, Paul is personally working on the build with support from his father Michael, who is a long serving building site manager for Taylor Wimpey. Special thanks must also go to local builder Paul Burr, who has been out of work but still prepared to build the shell for no cost. Please take the time to look on our sponsors page, even at a time of economic tough times we have been staggered by the support these companies have given to both the project and BCT Aspire in general. It has been a joy for us to get to know Cole and the family over the last year and we are inspired on a daily basis by the amount things they have to cope with and still walk around with a smile on their faces. It will include a downstairs bedroom and wet room to help Cole’s development. We are pulling together volunteers, good hearted merchants and tradesmen and the family themselves to get the build completed. We have been delighted with the response of local people and businesses who have helped us to keep the build moving towards completion. Please get in touch if you can offer anything that may help us in completing this build.